The more diligent YellowBrick watchers amongst you will have noticed that I’ve started moving rather speedily in a north-easterly direction. No, I didn’t smuggle an engine aboard, nor am I hooked to a giant fish, as in ‘The Old Man and the Sea‘… I am safe and well aboard Cloud Nine, one of the Great Pacific Race support yachts, and Darien is chugging along happily on the tow rope behind us. This has been a far harder decision for me to make than the change of direction, and one that I would never have imagined making when the row began. As you know, I have been struggling with adverse winds and difficult conditions since the start, and although these have altered with my change of course, they have not abated. 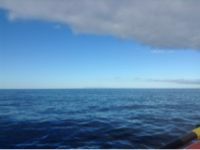 Since turning east there has been the odd day of light or more helpful winds, but overall rowing conditions have still been frustratingly challenging. I was able to row about sixty miles past Isla Guadalupe to the south, but the likelihood of reaching mainland under my own power has been receding with each weather forecast. For the past ten days I’ve been feeling like I’m on a roller coaster headed to Antarctica, and however much I struggle to get off it and row towards mainland I continue to be hustled south by the wind, waves and current. Once again I have found that I have had to make a decision based on progress, current weather, forecasts, and position. Any further south and the mainland peels away even further to the east, tropical cyclones grow in threat, and I would need more than a miracle to see a complete reversal of prevailing conditions. Whilst weighing up the slim possibility of a miracle against the reality of my speedy progress south, I was told that Cloud Nine would be able to offer their assistance in reaching land if I didn’t delay much further. One thing I’ve learned from this adventure is how to make difficult decisions on my own. Although this is not a decision I would have taken if I had control over the elements, it was the only sensible option based on my southerly position, the weather, and the forecasts of weather to come. I’m now looking back at Darien rather than looking out from her deck, but the adventure is still not over for me. With several hundred miles and some days left before we reach land, I’m looking forward to experiencing the ocean from a different angle and to resting my aching hands. Every ocean row has it’s dangers and risks, and it should never be taken for granted that a rower will complete the challenge. Elsa has faced some extremely difficult choices and it’s testament to her resolve and courage that she has decided to change course. I’m very proud of her continued resilience, especially when she must be struggling with fears of failure – she has not failed! But whatever happens, she stepped aboard the boat when very many wouldn’t. Mexico awaits a heroine and she’s on her way! 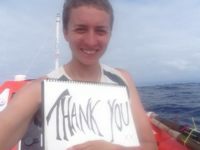 I am full of admiration for Elsa, not only for the tenacity and determination that she has exhibited over the last five weeks as she battled persistent headwinds, but even more for her wisdom and maturity in deciding to change course. I applaud her decision, and look forward to congratulating her in person when she returns to Britain. Elsa’s perseverance both in pushing toward Hawaii for a month and a half, and then back toward Mexico for the last few weeks, has been immense. 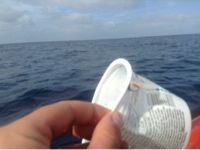 The Pacific is an unforgiving ocean and her row has been particularly harsh. 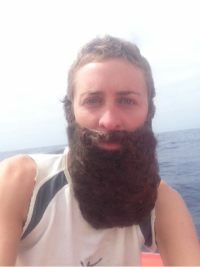 Broken oars and the highest miles per rower, are testament to Elsa’s incredible effort. Elsa is understandably upset about having to change plans, despite her knowledge that these decisions were the right ones to make in the circumstances. What she has achieved has been incredible: 950 miles over almost two months under her own efforts; highest miles per rower to this point; intense perseverance under difficult conditions and having to make such challenging decisions balancing complex factors. Even so, she’s experiencing a wide range of emotions. Please also consider further supporting Elsa’s three charities: Global Ocean, the GREAT Initiative, and Plastic Oceans. Follow the links on her Causes page. Finally, I’ve got around to writing a long-overdue blog, promised sometime back in May. Having been on sea anchor for the last four days, not much has happened except for me getting progressively sweatier and more fed up and ready to row, so I thought now would be a good time to make good on that promise. Why did I name my boat Darien? It’s been on my mind throughout the journey, and although my thoughts are probably a little convoluted I’d like to share them. I came across the name Darien when I was a child, on first reading what soon became one of my favourite books: ‘Swallows and Amazons’. If you don’t know it, I urge you to get hold of a copy and read it today. For those who haven’t read it yet, the first chapter is mainly set on a promontory that the children have named Darien. It reaches out across a big lake, and from there they can look on the island that they are hoping to go and camp on and the lake they want to sail and explore. This is still one of my very favourite books, partly due to nostalgia, but also because it is just brilliant. In ‘Swallows and Amazons’, for me, the peak in Darien always meant hope and and possibility of future excitement. It is the beginning of all the adventures, the place where plans are made and places are first glimpsed. This is a poem about new experiences, about seeing things for the first time and in a new way. Every time I say those final lines to myself I feel a shiver of excitement. I’m seeing things out here that no one in the world has ever seen before and nor ever will – sunsets, fish, waves, clouds – they change and change again and continually re-form. It is a strange feeling to be looking at, say, a fantastic sunset, and know that no one else in the world can see it as I’m seeing it. By the time it reaches other people it will have changed into something different. This journey was also about learning to see parts of myself and my own life in a new and different way – so much time alone has offered me a lot of time to think. Darien is of the Pacific, and for me is a place from which grow adventures and from where new things are seen. My little Darien has definitely not disappointed. One thing I’ve learned about the ocean is that no two moments are the same. Even though, in theory, I’m doing the same thing every day, the changing weather and light and waves means that no two days are indistinguishable. Sometimes the difference is subtle – a shifting of some clouds or the brightening of the sun – sometimes the contrast is more stark. Yesterday morning I awoke to a pink dawn and a flat calm sea, so still that I could see Darien reflected in the water and at the same time watch the fish and the rays of light reaching down into the deep. 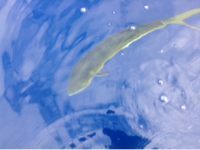 There were two determined biggish fish, intent on hunting the little ones that had gathered around the barnacles on my rudder, and their bodies slapping the side of the boat as they pounced was the only sound I could hear. This morning I was greeted by the howl of strengthening wind, crashing waves, and the sharp impact of my elbow and shoulder with the cabin wall when I tried to sit up. I’m now lying on sea anchor and expect to be here for two more days before I can row again. It feels a bit like I’m back in the earlier weeks of the row, with waves crashing over the boat and battering us from all sides, but at least I’m not cold. The hours in the middle of the day are hot and airless in the cabin, and I lay with a wet cloth of my forehead and my eyes closed, bracing myself at the impact of waves trying to let my head accustom itself to being thrown around so much again. Even with the sea anchor out I’m losing ground to the south – ground that I will have to make up again – but far less that I would be without it. Even after Friday, when the winds should calm down to a sensible level, the forecast doesn’t look good for the next week. Although I generally haven’t got headwinds, I have a lot of crosswinds and some complicated currents to navigate – still a few hundred miles of difficult rowing to go. I’ve been thinking quite a bit about forecasts. I’m so much more aware of them out here, and I try to anticipate what is expected by rowing in a particular direction, or pushing myself extra hard while the winds hold. At home I’d generally look at if it was going to rain, how warm it was going to be or if the sun would shine. With the forecasts I’m receiving I never know to expect those things – I don’t have any idea if I should expect rain, or clouds, or sun, or warmth, or cold, but I do have a pretty accurate expectation of wind speed and direction. Along with currents and wave height, this is the only forecast I’m interested in, and the only change that makes a significant difference to my rowing, for better or for worse. Finally, I just wanted to share a little triumph I had yesterday. 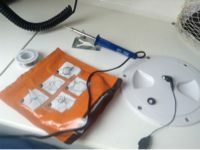 I’m not particularly practised at DIY, and especially anything to do with electrics, so when I found my satphone earpiece not working my first reaction was that there would be nothing I could do. Things with lots of wires worry me, and I’ve never been excited about the idea of taking them apart and looking inside. The earpiece has been one of my favourite pieces of kit on the boat though – the satellite phone is plugged in right in the corner of the cabin, under my electronics panel, and the earpiece is extendable, meaning that I can lie back and speak on the phone rather than huddling into the corner with my head under the panel (I could unplug the phone, but the signal is not so clear unless I go outside, and I’d rather not risk the one thing that brings me messages, voices, emails and weather forecasts) Knowing how useful I find it, I decided to open it up and see if there was anything to be done (although I confess that I did put it off for about 12 hours before tackling it). I found one of the wires dangling free, having been pulled away from the spot it had been soldered to. Solder! Suddenly I was excited. Before I left, Steve had been keen that I add a soldering iron and some solder to my tool kit, just in case, and he’d found a portable one that plugged into the sockets I have in the cabin. This was my chance to use it. I lay everything out, using an empty expedition meal packet as a workstation and did my best not to burn my fingers or ruin the delicate wiring with the hot melted solder as the boat rocked and bobbed around. After waiting for it to cool down I tried it out – it worked! I know this probably sounds like a ludicrously little thing but it made my day, and I still feel a thrill of triumph every time I use it. Huge congratulations to team Uniting Nations for finishing the race first and setting a fantastic new world record. I shall miss catching up with them in Hawaii, but hope they get some well deserved R&R there! More info on the Great Pacific Race website, and a brief interview on KITV. If you’ve been following my tracker you might have noticed how close I’m getting to Isla Guadalupe. When I woke up this morning I could see a low dark smudge on the horizon, which looked like a cloud. Although I’m still about 40 miles away, it has been grown larger and clearer all day as I’ve pushed toward it. Guadalupe is the rugged remains of two ancient volcanos, and towers high out of the water, so I’m really looking forward to seeing it become even clearer tomorrow. As you might have guessed from the title, Guadalupe is not my destination – I need to row past it and then on for several hundred miles more to mainland Mexico. It would have been a hugely exciting place to land, but unfortunately not ideal logistically. It is still pretty awesome to see it though, and anyone who has been at sea for a long time will know what it’s like to first look on land again (even if it’s just a small island). Suddenly my horizon does not stretch out the same distance in every direction; it is not an unbroken circle all around me. My eyes can’t help but be drawn to the lumpy shape in the distance. Tonight it is cloudy, but I’ve been lucky most of the last week to have clear night skies. Last time there was a run of clear skies at night, a few weeks ago, there was also the brightest moon I’ve ever seen – breathtaking in itself, but not good for stargazing. This week I’ve been rewarded at night with the most fantastic night skies. The stars reach down to the flat horizon in every direction, every single one visible and unobscured by hills, trees or houses. It’s like being upside down in a star filled pool. There are just so many of them, and the whole sky seems so much busier out here. Stars are twinkling on top of each other, shooting stars flash across the sky, and the whole sky shifts gently and the boat bobs around. I’ve caught myself with my mouth hanging open on numerous occasions, completely unaware of myself as I gaze upwards. I just want to say a huge and special thank you to all of you have supported and are continuing to support me out here. Having to change destination has meant that all our careful planning for the arrival and subsequent logistics have had to start again, leaving us facing numerous unexpected costs. Poor Steve is busy running around making arrangements, while I’m focusing on pushing out the miles without being dragged too far south. I’m so grateful for all of your donations, and touched by the messages that have come in with them. We’ve closed new mile dedications, but have seen a massive jump in oar strokes being donated – fantastic, as there are a lot of strokes happening out here at the moment! The last couple of days have been long, hot and hard work, but the email that Steve sent through to me with all your messages and donations honestly made my day today. Please continue to spread the word on Facebook, Twitter and by email – Elsa still has a way to go to cover costs and reach her funding goals for the three fantastic charities she is supporting. Support Elsa’s journey home – donate as many oar strokes as you wish at £0.10 each!